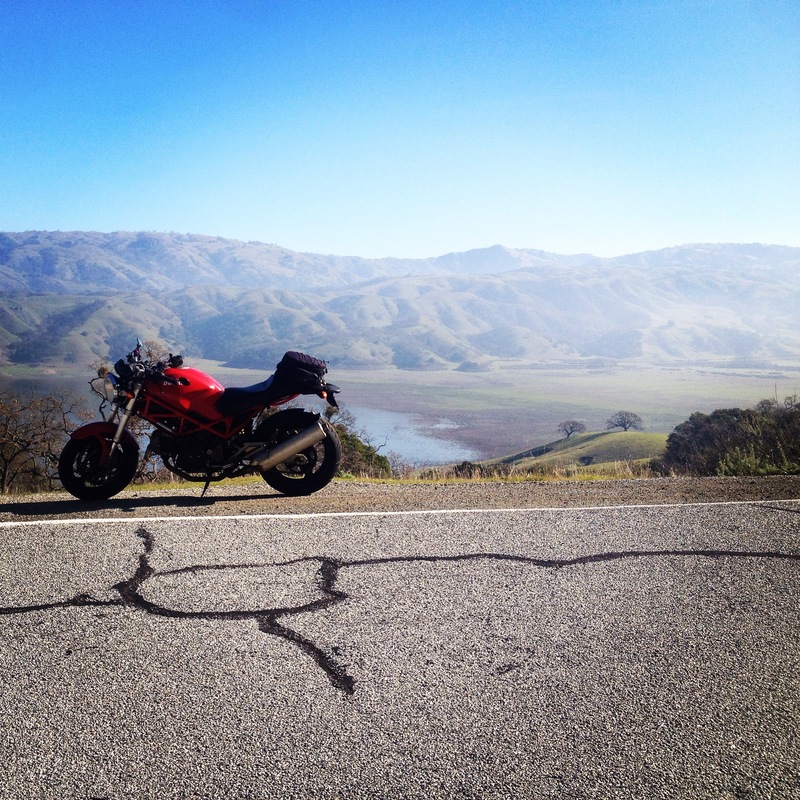 She’s a 2005 Ducati Monster 620, that is now a 695, with now over 100,000 miles done as of August 2016. It’s hard to write about a motorcycle that I’ve done so much with, so I’m just going to go by year. 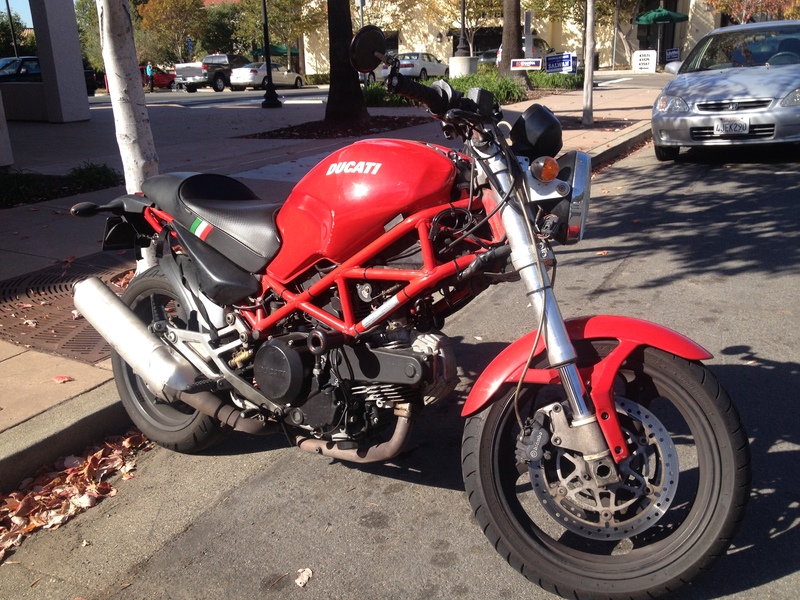 It started in 2006 when I bought a used salvaged 2005 Ducati Monster. At the time I might have paid a bit more than I needed to for it, but I was and still am happy with it. Nearly everything done since has been either to enhance comfort or repairs from the result of some mishap, which admittedly happened with some frequency when I first got the bike. The first changes were adding handle bar risers to give my back and wrists some relief with all the around town riding I was doing. Then came the aftermarket seat, because the stock seat was painful after about 100 miles or so and I was already doing long rides after 6 months on the bike. The first incident that demanded repairs was December 30th of 2006. I locked up the front brake in a panic moment and went down. Nothing too bad done to the bike, but the front rotors were warped, the headlight broken and I banged up the tank pretty badly. So I had the tank cleaned up and repainted and put new rotors and brakes from a 800 Monster on it. I also got a new headlight assembly off of a another Monster. This ended up with the bike looking better than it ever had which was weird and not normally how crashing a bike works. The bike ran great for the next couple of years, with the only changes made to the bike being some cool CRG lane-splitter Mirrors. Then in late 2008 the dash began to act up. First the speedometer stopped working then then the tach eventually died. Instead of fixing this (like maybe I should have…) I instead bought the damn BMW F800S. While riding the BMW I purchased a used dash on Ebay with the intent of fixing up the Monster and selling it. I’m glad I didn’t have the chance. After the BMW tried to kill me, instead of buying another motorcycle I brought the Monster back out of retirement. The monster and I were up and riding early 2011. Again I had a good couple of years of riding, the only changes I made to the bike is adding a USB chager to the SAE I had set up for my amazing heated vest. Then early in 2014 my clutch began to show signs of beginning to slip and my sturdy little 620 had about 70,000 miles on her by this time. I once again began to contemplate a new motorcycle. Given how that went the last time, I decided that instead I would invest in a barely used 695 engine and give myself a bit of an upgrade. This went great (but not without it’s minor drama) and for a few weeks I had a Monster 695. Then my chain decided to break and send me into another dilemma of what to do with the Monster. I once again decided to keep it and with the help of some awesome people I got new cases, cannibalized a stator cover off my old engine and I’m back on the road, again! So, now I have an Engine with parts from three different Monsters, brakes and headlight from another couple, with the seat being aftermarket there is much that isn’t anything close to original. Tank and frame primarily. I even have one of my wife’s wheels on my bike due to a bit of tire wear cheating. With that many donner parts, there is really only one name for the bike. My first “real” bike was a Multistrada 620. Great engines, great handling, great brand. But you’re right, it doesn’t take much to “total” a Ducati due to cost of parts! Still, I’ll always love and miss that bike. Looking forward to reading more from you. Don’t tell my bike this, but often I wish it was a Multistrada instead of a Monster. Such a great handling bike, with a bit of wind protection! I talk a lot about long rides in that. If that doesn’t answer your questions let me know and I’ll do my best to answer them. Yes, I have read your post and it’s super encouraging. I’m just trying shake off this impression that I need a bullet proof “touring bike” to do long distance but your shared experience has really helped. I think what you said about maintenance is what I really needed to hear 🙂 Thanks.